The CADWAGO project aimed to improve water governance by developing a more robust knowledge base and enhancing capacity to adapt to climate change. The three year project was led by Neil Powell (SEI) and managed by Annemarieke de Bruin (SEI) and brought together 10 partners from Europe, Australasia and North America with extensive experience in climate change adaptation and water governance issues. The outputs of CADWAGO are listed here. The CADWAGO blog captures the reflections of researchers during the project and includes links to material used at governance learning events. CADWAGO built on lessons from ongoing case research to create a forum and dialogue between researchers and stakeholders at different scales. Lessons from the cases were synthesized and used to adapt European decision-making that has a global impact. 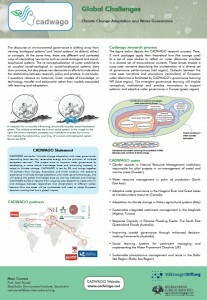 The poster on the right provides more information about the background and set up of CADWAGO. What changes are needed in the existing conceptualization and framing of different modes of water governance to enable systemic and adaptive responses to climate change? What practices and processes are necessary to foster systemic and adaptive responses within water governance? The research lenses related to these questions are further described here: ‘Research lenses’.